Alice MacGillivray’s story is one that so many people can relate to. After riding a bit as a teenager, Alice’s love of horses and riding got set aside for other priorities: education, family/children, and career. Many years later, Alice’s horse dream came back to the forefront, and she prepared to move to the country and buy her first horse. 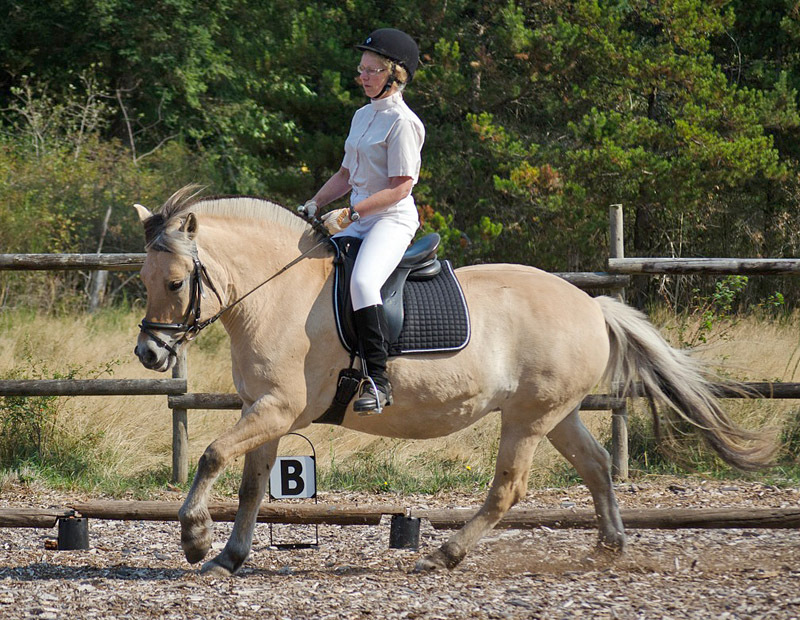 Fascinated with the Fjord breed, Alice did extensive research, then took the plunge and purchased a nine year old Fjord mare, Bocina, from my Bluebird Lane farm. Around the same time, she started taking riding lessons, her first time back on a horse in decades. Bocina arrived at Alice’s west coast island home in the spring of 2011, and Alice set about building a relationship with her, learning to become both a horseman and a rider. With dedication, the guidance of two coaches, and the support of the Gabriola Horse Group, Alice has progressed from beginner rider to achieving a huge milestone, which I wanted to share with you. Recently the GHG put on a Test Ride Day, in which Alice and Bocina participated, the duo scoring as high as 65% in Training Level Test One! I just want to take a moment and acknowledge what a huge accomplishment this is, as we all know, going from total newbie to riding a Training Level test in public and getting a very nice score indeed! I’d like to congratulate Alice on her result, but also on all the work that went into getting there, and also for getting out to participate in the event. And, I wanted to share her achievement with you, both as inspiration and because we can all learn so much from each other. It’s nice to have this prompt to reflect. Of course I see Bocina every day, except for perhaps ten days to two weeks a year when I’m away. So progress has been incremental and often slow and — on rare occasions — discouraging. So with a landmark like this, it is important to take a step back. So I may answer with more than you wanted! Of course this wasn’t quite a “show”. A local dressage judge generously offered to assess us and a young woman on the island looked after the overall organization, and lots of horse people — with or without dressage experience — stepped in to help. We were encouraged to choose two tests. 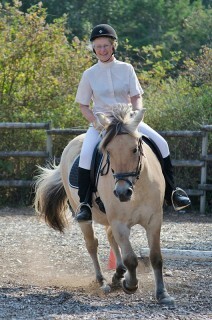 We were to ride each twice with input from the judge between the two. We didn’t see each others’ scores (though there was a little bit of sharing), and there was no dress code and no ribbons. One of the helpers has been to many horse events at this ring over the years and said she had never seen such a nice event. Her main focus was the horses: they all looked happy and relaxed. One of the big things for me has been to see and hear the feedback. It’s one thing for a supportive coach to say you’ve done well in a lesson, or for a supportive friend who rides western to say you look good. But to hear feedback from you, and feedback from the judge a week after the clinic, and see the picture of her genuinely smiling as she judged, brings it home to me that I/we have really made progress. That is probably the biggest thing I’ve learned. Another great thing is my trust in Bocina. It was risky to try the Training Level test. I had not gotten through it successfully in practice. But as you said in the ad: “Bocina is suitable for a beginner, child, or timid rider…She does not get worried by mistakes…” So I knew the worst thing that could happen would be I couldn’t get her to stop cantering (the most dramatic problem in practice) and that people would laugh supportively as I cantered around the ring showing lots of body language attempts to slow her down. As a friend said a few days before, “I wanted to call out to sit back, but I could see you were doing that!” So I wasn’t afraid to stretch a bit and try Training Level, knowing that if I didn’t try I would kick myself for missing such a great opportunity. I rode the Training Level test twice and my score went down the second time. It was funny – the only really anxious moment was after the elation of doing well on the first Training Level test, I suddenly realized I had to do it again. Her canter in the second circle was very enthusiastic and I chickened out and tried to slow the canter. She broke into a trot and that was the big point-loss mistake. I wouldn’t have done that if it hadn’t been for the extra adrenaline! Another learning came from seeing pictures of me riding her. I have a few taken by friends, but there was so much structure to this event, and the local photographer took so many pictures, that I was able to learn more. One surprise was around longitudinal suppleness. My coach has tried many things to help me figure this out, and eventually I started to get it. But it’s not always easy or “buttery soft”. I was surprised to see in the pictures that her position isn’t bad. Obviously we aren’t at the beautifully collected stage, but when I look at some of our pictures, I think I’d be impressed if I were watching her as someone else’s horse. 1. Buy the right horse. I admire the women here who have rescued horses off the track etc. but they had a stronger background than I did. And I have seen some mismatches as well. When I do have a tough stretch, it is clear to me that I need to learn; there isn’t the extra ambiguity around sources of problems. And have enough resources set aside to be a reliable, caring and ethical horse owner. 2. Find a great coach and do your best to learn (although I really wish lessons were videotaped as it is still pretty overwhelming). 3. 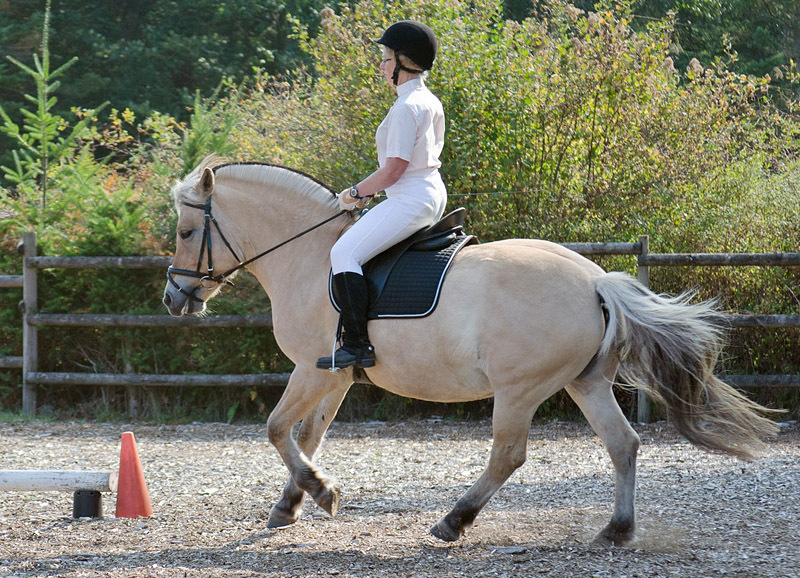 If you are new to horses, find lots of ways of learning. Mine have included self-board, spending time with other horse owners, books, etc. I have learned quickly and, more importantly, have quickly learned a lot about what I still have to learn. 5. I could go a in a real show. 6. I did have a decent reason to wear the white pants. 7. Don’t rely on a caller or on anyone else in any support role; keep the mind on everything. So, yes, I enjoyed it! A big part of that enjoyment was the safe, supportive, community environment. It was a great way to look at progress in a more quantitative way. Although our scores weren’t nearly as high as some, I was the only “mature” rider to tackle something above a walk-trot test and I think that was a novelty and hopefully an inspiration for some others. And of course it is fabulous to have a Fjord at a dressage event! This is Lori again: Alice referred to the safe supportive community environment of her horse group, and I see that as a big part of success. I call it “group energy” and it is that extra spirit or lift that comes into being when you have a group of like-minded individuals getting together for a common goal or intention. Like the geese flying in formation, working together as a group gives every member extra updraft. Because this factor is so important, I want to talk about the dynamics of group energy in a future article. And the white pants comment deserves a mention 🙂 When Alice came to visit our farm and take lessons on Bocina before taking her home, I had some riding pants I was sending to be sold at the second hand store. I had been working on a health and fitness program that was successful for me in that I was down a couple of sizes and I had to replace my breeches. Alice tried on my white show pants, and said that although she didn’t quite fit into them yet, she wanted to pay me for them because her intention was, in addition to becoming a rider, to lose weight and get into these white riding pants. A year and half later, Alice was able to demonstrate the achievement of all these goals: building a good relationship with her horse, becoming a good rider, AND, slimming down to wear those white pants while showing off her new skills. Congratulations again Alice, and keep up the good work! All photos of Alice and Bocina by Brandi Meyers. Thanks to Brandi Meyer for taking the photos! Just plain awesome and Congratulations to both you and Bocina!!!!! Another great article. I love receiving your emails, very inspiring and always good to read when my motivation is taking a hit. Now if only i could have on of your fjords down here in Australia..! What a lovely article, and amazing pictures! 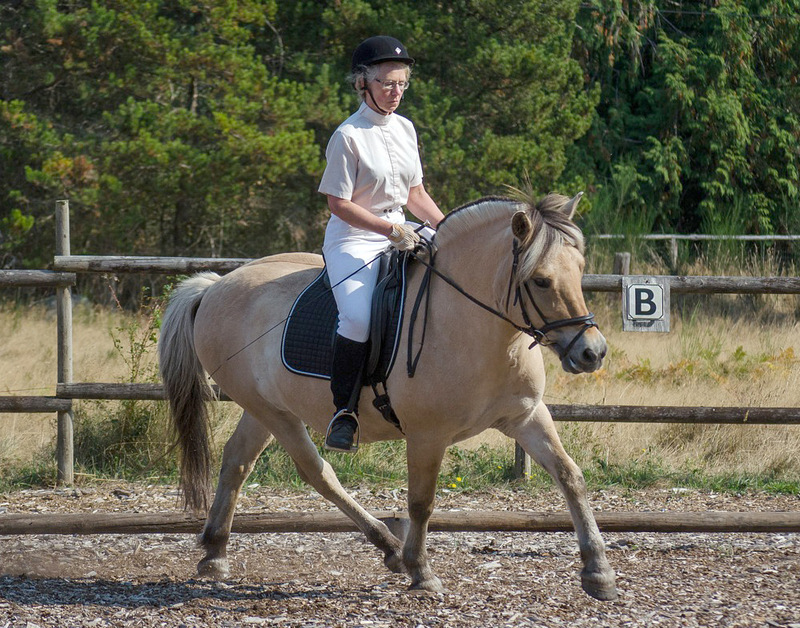 In explaining the nature of Fjord horses, I said to Dana that their unique and powerful structure is intended for strength – to which my husband replied, “yeah – just like a Ford” … thought that was cute. Hope you chuckled just like I did. Love to you, Alice, from M and D.
I am at work and looking at the website, fascinated with Fjords! I have been into Warmbloods and 3 Day Eventing but have decided to focus more on Dressage and pleasure riding including Natural Horsemanship playing with my horse. 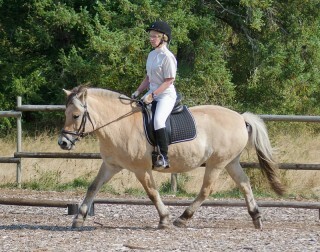 It looks like a Fjord is just what I want, as I want to start a small breeding program too. Please contact me about possible purchases!